In this episode, Don and Rob are joined by their friend Chad to talk about the movies that they know are awful, but can’t help but have soft spots in their hearts for. This journey takes the trio from classic 50’s monster movies, to the heights of 80s cheese and the depths of Asia’s cinematic vaults. Thrill to Chad’s love of Ed Wood! Stare in shock at Don’s encyclopedic knowledge of 80’s horror! Wonder at Rob’s passion for backwoods monsters! All this, and Don’s dramatic twist surprise that Rob and Chad didn’t see coming, are waiting for you in this episode of the Department of Nerdly Affairs. I include myself in the legion of fans who watched the Star Wars Holiday Special during its only broadcast in 1978, although I don’t remember much of it. The plot was so glacial that I lost interest, with my only clear memory being that of the cartoon clip introducing Boba Fett. I enjoyed your excellent commentary on this horrible show. You could produce an entire podcast featuring all of the terrible “Mad Max” wannabes, or maybe one featuring only “Monster Bugs,” which was its own genre for awhile. >my only clear memory being that of the cartoon clip introducing Boba Fett. That seems to be the dominant attitude for anyone who saw it when it was aired. It’s SUCH an oddity…. and I kinda hope we’ll see a Blu-ray, restored version now that Disney owns Star Wars. This needs to be preserved forever; mostly as an object lesson, so it can never happen again…. >I might have included “LaserBlast” in your list of bad movies. This one has come up a few times in discussion. It’s another weird one; sort of sci-fi crossed with a slasher flick. Holee Smokes yes! Funny you should mention that, ‘cos we skirt the topic in an episode coming up REAL soon…. >maybe one featuring only “Monster Bugs,” which was its own genre for awhile. Oh yeah! The giant bug thing seems to come and go. There was a huge spate in the 50’s, and then again in the 70’s…. although the 70’s run was usually tied in to the “nature runs amok!” genre. In no objective way can anyone argue that “A New Hope” is a bad movie. I’m sorry. That’s just not possible. Things are only good or bad in contrast, and Star Wars by any measure was a super film in 1977 from any science fiction action film before it, or even along side it. It wasn’t just a box office smash. It also set the pattern as much as Lord of the Rings set the pattern for Fantasy. For decades afterwards you either are LIKE Star Wars or you’re doing everything to be UNlike Star Wars. I’m sorry Rob, that was a huge Gong Show strike for me when you said that. Secondly, I like Don, was impressed and horrified by the Star Wars Holiday Special. I saw it as well. You guys are forgetting the obvious. In a world of the Krofft Brothers is it REALLY that hard to understand? When you talk about television version of kids fantasy in the seventies that’s what everyone remembers. Thirdly, I’m shocked and dismayed that your list is pretty limited to Asian bad flicks and not North American tales. Yes, thank you for mentioning Hawk the Slayer, that would have been totally on my list, but trust me there’s a ton of turkeys made from Hollywood or Near Hollywood. Deathrace 2000. Come on. This is a bad movie I watch annually. It’s infamy has birthed two recent sequels, one very much in the same vein, one not. What about some really bad turkeys like Highlander 2 which is virtually unwatchable? He-man and the Masters of the Universe which is nearly unwatchable? Batman and Robin which is the only movie I walked out of the theatre. Kingdom of Spiders which is an awesome Shatnerized horror movie. But the granddaddy of awful awesome movies is the movie that was so bad it never made it to the theatres, so awful it skipped Video rentals. The movie so bad you had to find a bootleg copy. This is a movie where they spent all their money on the Thing and Doctor Doom outfits and they are STILL better than the current Hollywood incarnations. A movie that you stop watching it as a live action show and into some of the worst animation seen in a science fiction movie as the only time the human torch goes full Flame On! Thank you for mentioning Buckaroo Banzai (I haven’t heard it yet but it was in my mind). This is a movie I never understood why people loved so much. I keep watching it to see if I understand it any better. It’s overly wrought with thinly drawn characters, a Barry Sue of a protagonist and the most incomprehensive plot since… well, since Highlander 2! So much fun. As annoyed as I am about A New Hope. So much fun! LOL Keep it up! >In no objective way can anyone argue that “A New Hope” is a bad movie. Well…. I think you CAN; although it’s maybe not a really solid argument. You could always say it’s just a mix of clichés and standards from the stuff that came before. (Kinda like people complain about “The Force Awakens” and oddly don’t for “Rogue One.”) I’d still say that the mix really did produce something new; but the argument isn’t totally without merit. >In a world of the Krofft Brothers is it REALLY that hard to understand? When you talk about television version of kids fantasy in the seventies that’s what everyone remembers. >I’m shocked and dismayed that your list is pretty limited to Asian bad flicks and not North American tales. I think part of that is because Asian film makers have a knack for unrestrained weirdness. Plus; a lot of our bad movies are bad ‘cos they’re uber-derivative. You can only see so many 80’s post apocalypse films before they all start blending together. Asian filmmakers have the same problem, but any rut that isn’t your own is novel. >there’s a ton of turkeys made from Hollywood or Near Hollywood. Oh yeah! You should see the list of films we DIDN’T get to. I think each of us had 40 or so. ‘Course, the criteria was that we had to LIKE the films in question. Stuff like “Asylum,” “Children Shouldn’t Play With Dead Things,” “Doctor Terror’s House of Horrors”…. and a bunch I didn’t consider bad enough for the list. 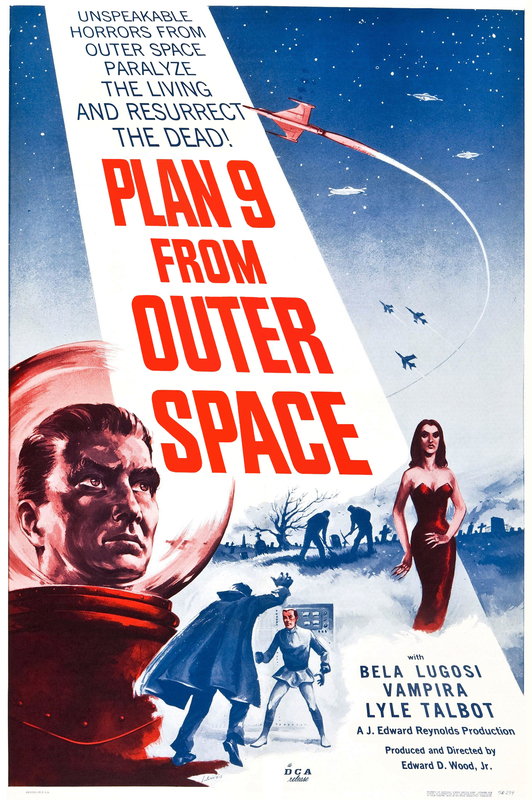 Like “Night of the Comet,” “Battle Beyond the Stars,” “Gargoyles,” “Message From Space,” “Fiend Without a Face”…. >Deathrace 2000. Come on. This is a bad movie I watch annually. I don’t consider it a bad movie. It’s over the top and kinda cheap, but those don’t make for a bad flick. Funny thing; I don’t think most people who make the “hit that guy, 40 points!” joke while driving realize that’s from a movie. >It’s infamy has birthed two recent sequels, one very much in the same vein, one not. THOSE I’d consider bad, but they go against the “you have to like it” clause. >Highlander 2 which is virtually unwatchable? >He-man and the Masters of the Universe which is nearly unwatchable? >Batman and Robin which is the only movie I walked out of the theatre. >Kingdom of Spiders which is an awesome Shatnerized horror movie. ….all but the last fall prey to the same clause. The last is bad in a fun kind of way, but there were SO MANY “spiders run amok” that I think other films did a better…. worse?… job representing the genre. AHAHAHAHAAA!!!! Yeah; that’s a good…. er, bad?… one. >Thank you for mentioning Buckaroo Banzai (I haven’t heard it yet but it was in my mind). This is a movie I never understood why people loved so much. I’m not a big fan either. My problem is that it isn’t over the top ENOUGH. They pay lip service to the weird, but everything then plays out like most action films of the day. Buck is SUPPOSED to be impossibly awesome, but EVERY action hero of the 80’s could do whatever the plot called for. Hell; even into the 90’s they were still doing that. The aliens were neat though, and the IDEA was cool, but for me; after years of violent Japanese cartoons and crazy European comic books it felt kinda thin. A year or so late to the party but I’m still catching up on older episodes and just listened to this this weekend. I loved the shout-out to THEM, though I also wouldn’t consider it a bad movie. I saw it first on one of the Buffalo stations after school when I was 6 or so, and I was terrified by the sound of crickets at night for years after. Picked it up a year or so ago and it still holds up, that little girl at the beginning needs to get some sort of retro-Oscar for a perfect one-scene career. I’d also like to throw out Fantasy Mission Force, though to some extent the story seems to vary by what version you have. I have an old tape with subtitles that is different than my brother’s DVD (which seems to be missing at least the intro sing-song at the Japanese village in Australia, just below the Samurai castle. During WWII). Amongst other awesomeness, it has an Elvis impersonator impersonator, two Chinese Highlanders in kilts, a slowed down bluegrass version of “Camptown Ladies” as a big battle theme song, WWII Japanese, WWII Japanese Nazis, 1970s muscle cars, and the President of Africa. And male stuntmen in drag wearing bags over their heads because they couldn’t round up enough stuntwomen for the Amazon village fight scene. I would round out my top 3 with the original Gamera (not sure it’s really a bad movie though, at least compared to what followed), and Hell Comes to Frogtown, with the late, great, Rowdy Roddy Piper.